A security operation in the Maré slum complex in Rio de Janeiro last Wednesday ended with deaths of seven people, including 14-year-old student Marcos Vinícius, and sparked outrage against the federal military intervention in force since February 16th in the state. Slum residents, relatives, friends, and teachers of the teenager staged protests and criticized the state's security policies. “This is the fault of this sick State that is killing our children in their school uniform. They are carrying bags and books, not guns, not knives. They are not robbing or selling their bodies, they are studying,” said Marcos Vinícius’ mother, Bruna Silva, according to El País. The deadly security operation was conducted by Rio’s police and backed by Brazil’s army and national security forces. Organizations in the Maré slum complex criticized the operation, while Rio’s public defender’s office filed a petition with the court to stop police helicopters from shooting at favelas [slums] or densely populated areas. Public defender Daniel Lozoya, from the office’s Human Rights department, argues that shooting aimlessly from a helicopter at urban areas is an extremely reckless attitude from law enforcement and that there are no reports of anything like that anywhere else in the world. NGO Observatório de Favelas (Slum Observatory) also criticized the operation on social media, stating that, once again, “security forces” used helicopters to shoot from above and put the lives of Maré residents in danger. Videos show a helicopter flying over Maré homes and gun shots are heard. There are also videos of children trying to hide inside local schools while the operation was taking place. The police are investigating the case, and a court ordered they present a report on last week's operation by July 1st. The intervention in Rio de Janeiro has been in force since February 16th, when Brazil’s security forces took control of the state's security operations, overseen by army general Walter Braga Netto, who reports directly to Michel Temer, the most unpopular president in the country’s history. The measure has been widely criticized and draw international attention after the execution of councilwoman Marielle Franco days after she was appointed rapporteur of a special commission set up to oversee state security operations during the intervention. 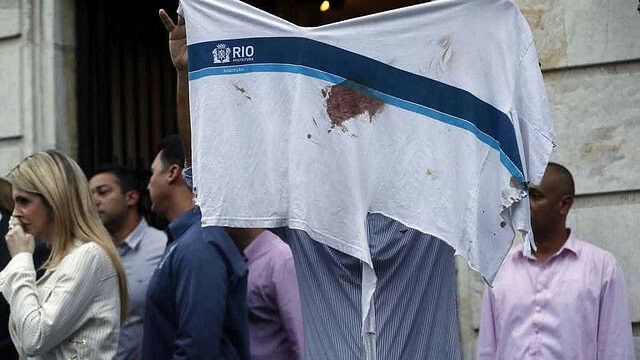 According to recent figures from the Intervention Observatory, the total number of shootings in Rio de Janeiro state increased by 36 per cent since Brazilian lawmakers approved the decree last February putting the Brazilian military in control of state security operations. There were 3,210 reported shootings in Rio, while 2,355 incidents had been reported in the four months preceding the intervention. Human rights organizations and activists are planning a series of demonstrations over the week to expose police brutality and violence in Rio’s favelas. Last Monday, parents and relatives gathered outside the state’s legislative assembly to protest for their relatives who were killed during police and military operations. They held banners asking the state to stop criminalizing favelas and poverty. Bruna Silva, Marcos Vinícius’ mother, called people for the protest. Dalva Corrêa, a mother who lost her son in the infamous Borel massacre 20 years ago, took part in the demonstration. “Our rights are violated every day. They kill us every day. Whether it’s Marielle or anyone else, they are going to criminalize us. The favela is not violent, it is brutally assaulted every day,” Corrêa said.